I have written a series of blogs on ‘Embroideries that Record History.' Obviously, this includes the Bayeux Tapestry but I have placed the sequence of the events of 1066 in an order which makes sense for the Norman victory. 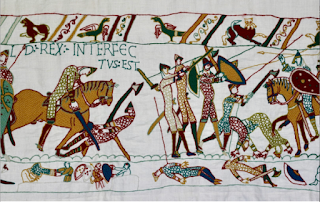 There are other related tapestries/large embroideries all of which record and explain 1066 and how this affected the development of the Western world. The others are contemporary. I have recently undertaken the enormous challenge to learn the technicalities of drafting and publishing my blog with the assistance of a student volunteer and hope you will take the time to enjoy my new blog series of these historical tapestries/large embroideries. I think that the topic of these tapestries will be of interest to stitchers and historians and also to the general public. I have always wondered why the Normans won the Battle of Hastings on foreign ground after having to transport every man, horse, armament and provision to get there. Now I know why.